Chief of Staff Gen. Mark Milley, whose number-one priority has always been rebuilding and maintaining readiness, is turning his focus to bringing Army acquisition from the Industrial to the Digital Age. In a letter sent Oct. 3 to general officers and signed by Milley and Acting Secretary of the Army Ryan McCarthy, Milley calls for an overhaul of the sluggish processes by which the Army buys and fields weapons in order to regain the technical overmatch it has enjoyed since World War II but has since let slip. “The competitive advantage that the United States Army has long enjoyed, however, is eroding. We are being challenged in every domain of warfare,” Milley adds. It has become an oft-parroted cliché at this point that while the Army was focused on fighting counterinsurgency wars in the desert, peer adversaries like China and Russia have “gone to school” on the U.S. military. The result is an Army unsuited and ill-equipped to fight a large-scale war with one of those capable adversaries that has full-spectrum combat capabilities, Milley says. 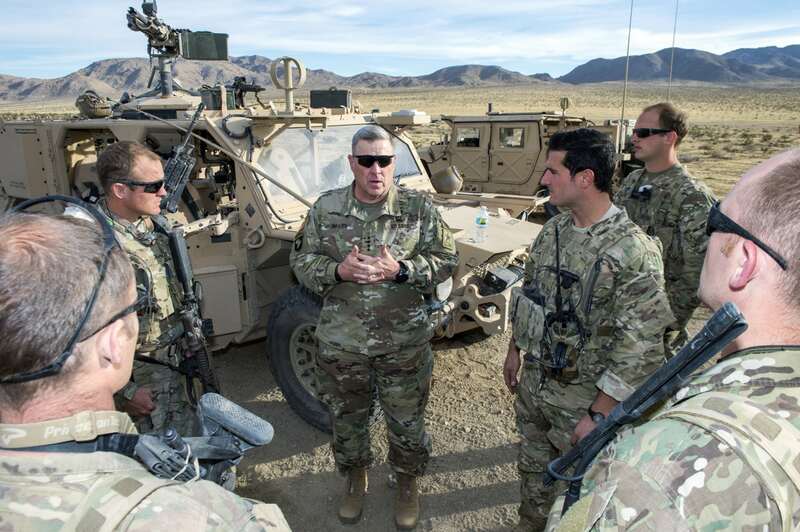 The sole focus of the new modernization strategy is making soldiers more lethal, Milley says. A more formal rollout of the reorganization Milley says is required to achieve his rapid acquisition goals is expected at the Association of the U.S. Army’s annual expo this week in Washington, D.C.
“We must turn ideas into actions through continuous experimenting and prototyping, improving acquisition business processes, pursuing appropriate commercial/off-the-shelf options and improving training,” Milley writes. He also calls for increased interoperability with allies. He next calls for a next-generation combat vehicle with manned, unmanned and optionally manned variants. Future vertical lift is needed to perform attack, lift and reconnaissance roles, also in manned, unmanned and optionally-manned variants. The Army needs a network with hardware, software and infrastructure that is “sufficently mobile and expeditionary. Air and missile-defense capabilities must ensure our future combat formations are protected from missiles and drones, Milley says. Milley then attacks the Army’s acquisition bureaucracy as bloated, slow and stove-piped, but provides few specifics about how the plan will be implemented within the ranks. He calls for enabling disruption, “the messy, chaotic work that is the hallmark of truly innovative organizations.” The Army will employ agile, “cross-functional” teams assigned to each of the six modernization priorities and they will report directly to the vice chief of staff and the undersecretary of the Army, he says.